If one was to seeking Jamaican food in the GVRD, it would seem logical to migrate over to Commercial Drive. However, what if you were in Surrey? How about if you were in an industrial area where all you'd normally find are auto repair shops and warehouses? In that case, the chances of finding a good Jamaican Patty is as good as Tiger Woods keeping his pants on. Well, to my utter surprise, I found one on Yelp! with only one review. Normally, I don't really trust any restaurant with only one review. After all, some of them are written by the owners themselves! But this didn't seem to be the case. In fact, I was so intrigued, I had to go visit it almost immediately. Woah, why the hurry? Honestly? Being out here in North Delta/Surrey, there are a plethora of really good Indian restaurants. No offense, but I'm a bit butter chicken'd out. Hey, if there is something different, I'm all over it! So I put the address into my GPS and off I went. Alright, while I was driving there, I was thinking to myself, "there is no way that a restaurant can be out here!" The area is completely industrial and the likelihood of finding a restaurant was not good. I did what the GPS told me to do and ended up in an industrial park full of various types of businesses. I circled around and didn't see any restaurant. At the point of almost giving up, I saw it out of the corner of my eye. Just like my Lee's post, I really can "see restaurants". Walking into the place, I was a bit taken aback that there were only 2 tables. Yes, that's right, two! I waited a few seconds and a jovial Asian man named Frank comes out and speaks to me in a Jamaican accent. Taking a moment to soak it all in, I decided to order a Beef Patty and Stewed Ox Tail. Flaky, authentic and darn hot (temperature wise), this really hit the spot. I really liked the meat filling, it was a bit spicy and moist. I could've eaten 3 more of these if it were not for the Ox Tail. And oh what a big plate of ox tail! Red beans and rice were served on the side with spinners. You see those long dumplings on the plate? Well, those are spinners. They are dumplings made by "spinning" the dough with both hands to form the long cylindrical shape. Hey, they're simple; yet very delicious. Although looking quite doughy, they were actually quite tender. The same could be said about the bounty of ox tail, they were super tender and modestly seasoned. To kick it up a notch (I can't believe I said that), I sampled the Habanero sauce. Bam! It was hawt! Alright, no more Emeril. While munching on the ox tail, Frank chatted with me about food and such. He suggested that I come back for the Cow's Foot. Hey, I'm game and I returned a couple days later. Knowing how big the portions are here, I did not order a patty this time. Served once again with red beans and rice, the portion of cow's foot was quite large. Soft, gelatinous, rich and damn good, I could've eaten more of this if it weren't so filling. Mixed in were tendons and tripe. This is definitely out-of-the-ordinary. I like it! While devouring this tasty dish, Frank offered me a traditional Jamaican holiday treat - Spiced Fruit Bun with Processed Cheese. 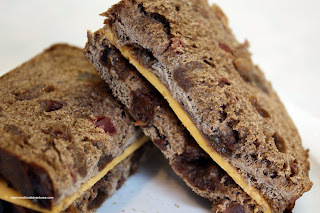 Think of it as fruit cake that is more like bread with a slice of Velveeta in between. A strange combination but pretty good. I couldn't even taste the cheese honestly. During this visit, Frank suggested I try the Escoveitch Fish on my next visit. However, I needed to pre-order it. I suppose this would ensure that they could acquire a fresher product. 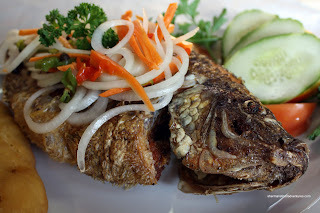 Essentially a whole seasoned Tilapia deep fried, this reminded me of the Moiara that Kim had at El Inka Deli. The aggressively seasoned fish was fluffy and moist beneath its crisp peppery exterior. It was so good that I had to confirm with Frank that it was indeed Tilapia. Usually, I'm not the biggest fan of this fish, I find it a bit mushy. Topped with escoveitch pickles (onions, carrots and habaneros), the dish was kicked up quite a few notches. This is not a bland dish! Served on the side were Festivals. No, there wasn't a party going on here; rather, they are slightly sweet cornme al fritters which remind me of The Reef's Johnny Cakes. I liked how the crisp (yet not oily) exterior gave way to a soft and sweet inside. 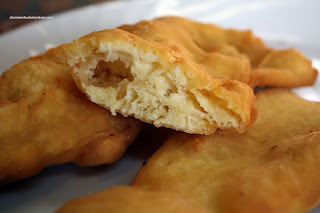 Not as fluffy as Johnny Cakes; but still enjoyable to eat. What a hidden gem in the oddest of places. Well, the reason behind this is that Calypso is more of a supplier of food to other restaurants such as Jamaican Pizza Jerk. Therefore, the restaurant part of the operation is not its primary focus. But, I don't mind since I can get some tasty Jamaican food in the middle of nowhere. Kim... then we ARE the same person! Who else would like both Ox Tail and Cow Foot??? They're open on Saturday 10 - 6! Was your GPS wrong by a lot? Maybe I'll take a trip there too. Nope, the GPS was right. I personally think it's worth the drive. Something completely different than the usual. Sherman! Holy moly. I take some time away from reading the blogs (to work on my own) and you just keep eating!! This place sounds amazing. Oxtail and foot. Perfect. LOL, I can't stop eating! 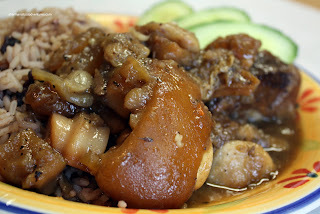 Yes, you can't beat oxtail and cowfoot. Well, maybe some tongue would be good too. Sherman I love you! Thank you, there used to be a Jamaican place I went to in the industrial part of Surrey but then they closed... Perhaps these are the same owners. I can't wait to try this place. The food looks amazing! You're welcome! Not sure if it is the same place, but the people at Calypso are very nice! Thanks for the clarification. Your father is a really nice man!